The BK cutting system supplies the best solution to accomplish sampling and short production runs in a variety of industries. It can be equipped with a variety of knives and pens, while being able to cut a range of different materials. 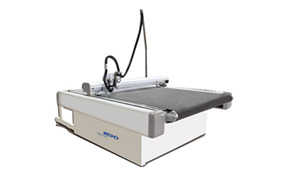 It is capable of high speeds, high precision cutting, punching, plotting, etc. 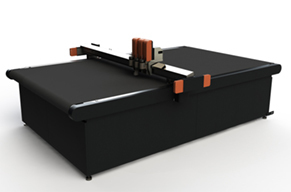 It can communicate properly with your current software and completes the transition from traditional manual sample cutting to advanced high speed and precision production mode, while meeting the different cutting needs of your customers. It comes with up to an optional three tool head configuration with a full set of inter-changeable tool heads. These tool heads can be equipped with your choice of knives, such as oscillating knife, creasing wheel, drilling tool, rotary knife, tangent knife, punching knife and appropriate knives, and the knives can be configured with different diameters and angles according to the material cutting needs. 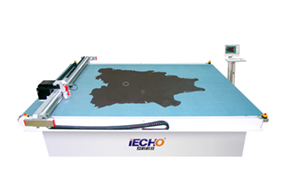 iECHO POT The Pneumatic oscillating tool is an air-driven tool with high frequency on the blade to cut the materials. The stroke up to 8 mm is suitable for cutting hard,dense materials, it can cut materials up to 50mm thick with special blade.IECHO UCT Universal Cutting Tool, used for through-cutting materials with thickness up to 5 mm, fast speed and low cost..
Suction device: With intelligent area air suction device, it can improve the production efficiency and save energy consumption to the maximum. Motor depth control: With servo motor tool depth control, it reduces the abrasion of cutting tool and enhances the cutting quality at the same time, realizes the international advanced two-stage knife raising and falling control mode, reduces the cutting time greatly, and improves production efficiency. Security system: The emergency stop button is installed at the corner of BK cutting machine, which ensures the safety of the operators. Control panel: With 7-inch touch screen, it can do adjustment freely on the material, such as control on cutting depth, cutting speed, and area air suction system, finish the preparation work before cutting, cutting control and adjustment effectively and quickly. 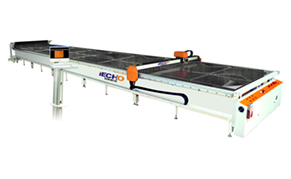 High speed: With advanced platform modular structure design and self-developed control system, BK cutting system can run very fast at 1.8m/s, shortens the product development cycle effectively, and enhances the production efficiency greatly. Precision: It can cut complicated allotypic designs with leading high accuracy among similar equipment at 0.1mm.